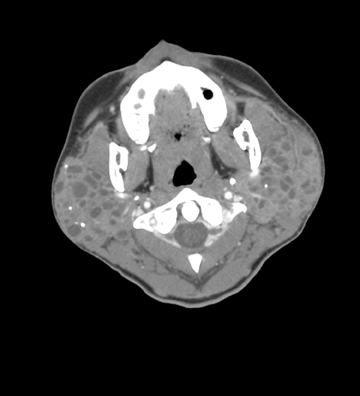 Contrast computed tomography (CT) imaging of the neck revealed bilateral enlarged parotid and submandibular glands with multiple intraparenchymal cysts (Figures 1 and 2). 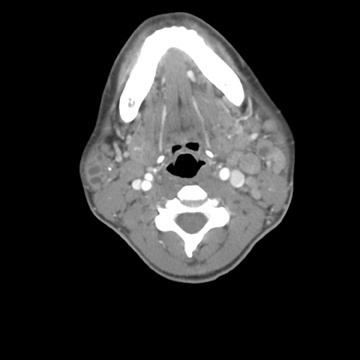 Punctate calcifications were scattered within the parotid glands, but no intraductal stones were present. Pertinent associated findings included bilateral enlarged level 1 and 2 cervical lymph nodes (Figure 3). Many salivary gland diseases can contain either solid or cystic components. When gross pathology reveals cystic lesions, the incidence of malignancy is close to 1%; whereas for a solid mass, the incidence is closer to 40%.5 Differential diagnosis for unilateral lesions containing cysts includes sialolithiasis, first branchial cleft cyst, HIV-associated BLEL, adenoid cystic carcinoma, and benign mixed tumor.6 With bilateral disease, considerations include sialosis, sarcoid, systemic lupus erythematosis, and BLEL associated with either HIV or Sjogren’s syndrome.6 Warthin’s tumor and lymphoma can be either unilateral or bilateral; however, lymphoma is usually solid pretreatment. CT and MRI provide useful means for evaluating both unilateral and bilateral salivary gland enlargement. When patients present with enlarged parotid glands associated with cervical lymphadenopathy, HIV is the diagnosis of exclusion. Uccini S, D’Offizi G, Angelici A, et al. Cystic Lymphoepithelia lesions of the parotid gland In HIV-1 infection. AIDS Patient Care STDs. 2000;14:143-147. Perling NM, Lin P, Lucente FE. Cystic parotid masses in HIV infection. Head Neck. 1990;12:337-341. Kirshenbaum KJ, Nadimpalli SR, Friedman M, et al. Benign lymphoepithelial parotid tumors in AIDS patients: CT and MR findings in nine cases. AJNR. 1991;12:271-274. Zeitlen S, Shaha A. Parotid manifestations of HIV infection. J Surg Oncol. 1991;47:230-232. Huang RD, Pearlman S, Friedman WH, Loree T. Benign cystic vs. solid lesions of the parotid gland in HIV patients. Head Neck. 1991;13:522-527. Brandwein MS, Som PM. Salivary Glands: Anatomy and Pathology. In: Som RM, Curtin HD, eds. Head and Neck Imaging, 4th ed. St. Louis, MO: Mosby; 2003:2039-2050. HIV-related benign lymphoepithelial lesions. Appl Radiol.